Taken during our KAUST visit - happy days. After a short illness, Margaret Williams (nee JEPSON) died suddenly on December 7, 2017, at the age of 69. Margaret Jepson joined Aramco in December 1977 where she was assigned to Office Services Steno Pool. Margaret worked in the Pool for a couple of years and then was assigned to go on recruitment drives for British secretaries and Asian clerical staff required at this boom time in Aramco. Employees recruited by Margaret will have fond memories of her as she did not just recruit but was ‘at the end of the phone’ to give help and support even after they joined the company. After a few more years, Margaret was assigned to work as Secretary to Saleh Hindas, Executive Director, Industrial Services and Andy Guinosso, his assistant-to, a job she thoroughly enjoyed. She left Aramco in 1990 to join her husband-to-be, John Williams, who had also worked for Aramco, and they enjoyed married life in her hometown in Derbyshire until John’s death in 2007. Her many friends will miss her cheerfulness and thoughtfulness. 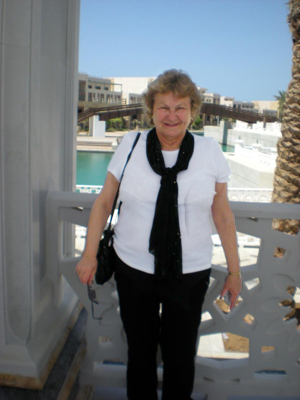 Friend Mary Wilson writes, "Margaret was curious to visit Saudi again so she and I signed up for the 2015 KSA Reunion. We were fortunate to visit Shaybah, Riyadh by train, Jeddah and last but not least Madain Saleh. Margaret so enjoyed her trip down memory lane and her reconnection with ex-colleagues/ friends who very kindly accommodated us and showered us with hospitality. Margaret, you will be sorely missed."